Does Lifetime bribe you with cookies? I think not! Christmas comes earlier each year, where soon Christmas will be year round and we will have a cure for overpopulation as millions kill themselves after the 5000th replay of Baby, It’s Cold Outside. On that note, Hallmark Channel has announced their two month long Christmas movie extravaganza! In September! Which sort of makes sense, because the first movie is on November 1st. Normally these cable channels are pretty bad at doing publicity for the film events on their station, so when a big press release gets dumped on their site as a news story, it’s my duty to copy it here (with commentary! ), and then bring up each film again as their premiere dates get closer. It’s also a big reveal which one of the 12 movies Hallmark is pushing the most, because one film already has its own section on HallmarkChannel.com! Can you predict which one it is based on the 12 movie descriptions? You just might be surprised! An aspiring astronomy professor finds unexpected Christmas romance when she meets a charming cowboy during her holiday travel. As she decides between this new cowboy and her practical boyfriend, she must decide whether it’s better to play it safe in love, or let an adventurous cowboy steal her heart. Wait, is this the plot of Back to the Future III? Will that cowboy have a secret weather experiment somewhere? Sadly, no. But it does have white people in love! With Christmas approaching, a handsome fireman afraid of commitment adopts a stray cat and meets a beautiful veterinary student who challenges his decision to remain a confirmed bachelor. I’m not sure what the cat has to do with the plot, except for the fact it made me care about the film. And will be a guaranteed better Christmas cat movie than The Grumpy Cat movie. 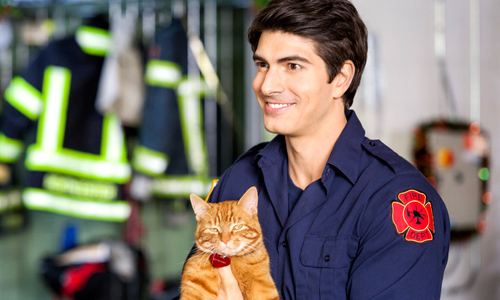 Superman is a firefighter and has a cat, and loves a vet lady, this will be ratings gold. It’s also unofficial Garfield fan fiction! Two longtime rivals and elementary school teachers duke it out during the holidays in a Christmas cookie bake-off, but their real feud ignites over a shared interest in a handsome single dad. With both determined to win the prize and the romance, their competitiveness could jeopardize what matters most this Christmas season. This sounds like an episode of a sitcom, but could make a funny romance film. Or at least make me want to get cookies! Northpole, the magical city where Santa and his elves live and work is in trouble. Families around the globe have gotten too busy to enjoy the season together, and Northpole depends on their holiday happiness to keep running. In the hopes of turning things around, a determined young elf befriends a little boy with a lot of spirit. His skeptical journalist mom doesn’t have room in her heart for anything but the facts, so it’s going to take a little nudge from his charming teacher to create an unbeatable Christmas team to turn around this town and share the importance of the season with the whole world. People are too burnt out about Christmas to enjoy Christmas, brought to you by a two-month long Christmas movie marathon advertised in September?? Corrine’s holiday season gets an unexpected dose of romance when she meets the mysterious Harold, who is on a deadline from a higher power to help Corrine find her true love by Christmas Eve. As the clock ticks down to Harold’s deadline, Corrine must decide if she will open up to Christmas love. It’s not Christmas unless someone is doing a riff on It’s a Wonderful Life. In fact, there are THREE films on this list that involve angels finding love for people on Christmas. That almost makes up for there being no version of A Christmas Carol. Almost. A young working girl with a blue-collar background is surprised when her new fiancé announces he is actually a prince of a small sovereign country in Europe. After the couple quickly takes off to spend the holidays at his family’s sprawling, royal castle, she must work hard to win over her disapproving and unaccepting future mother-in-law—the Queen—and find out if love truly can conquer all. Congrats! You’re now a princess and the media will hound you until they kill you, and the monarchy is an obsolete and ridiculous system in the 21st century. I think I’ll pass this one, even with Jane Seymour as the disapproving Queen. A successful children’s book author and Army widow loses her late husband’s German Shepherd, Buddy, only to later find him adopted by a new family – a single father and his daughter. Each finds a sense of Christmas spirit as they struggle to decide with whom the dog really belongs. Yeah, yeah, they’re gonna get married. But there’s a dog, and maybe funny dog antics. And possibly scenes where Teri Polo and Martin Cummins hate each other before they love each other. But I’m mostly here for the dog. Debbie Macomber is Hallmark’s golden goose, their films based on her romance novels score record ratings, and their first ever original series is based on her work. So it is only natural there is one of her stories in this huge batch of films, even if it is yet another angel romance Christmas film. When a driven doctor doesn’t get the prestigious position she planned for, she unexpectedly finds herself moving to a remote Alaskan town. While she meets the locals and even starts a new romance, she has to learn to let the life she planned for give way to a love she never could have imagined, and finds this festive small town is hiding one big holiday secret. With Christmas approaching, a struggling single mom finds herself working as a department store Santa Claus, as a real-life angel delivers good fortune and the possibility of holiday romance. So many angels will be getting their wings thanks to Hallmark Channel, that the resulting trillions of bells ringing will crack the Earth open and cause a mass calamity! I’m guessing Wallace Shawn is the angel, though it’d be hilarious if he was the love interest. With the holidays approaching, a young party planner arranges a special Christmas party for a New York toy store. When a powerful corporation threatens to shut her down, she decides to follow her heart, moving forward with the party plans and finding true love in time for Christmas. Why is a powerful corporation picking on a poor party planner? I don’t know, but this will be the best Christmas party ever if it is the party that starts the revolution that puts the capitalist pigs against the walls! ¡Viva la Revolución! A popular network morning host finds herself humiliated on the air by her fiancé and disappears to a small town. While there, she helps a budding artist save a community art center for the town’s kids, by helping them with their float for the annual Christmas Parade. Wait a minute, one of the Property Brothers is in this? I didn’t even know they had careers in made for tv movies! But is he the new love or the jerk ex-boyfriend? And will he get run over by a parade float? That would be a Christmas miracle! 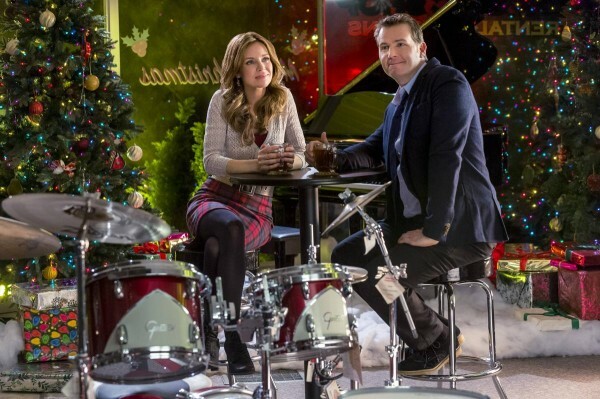 Did you guess which one of these film Hallmark is already pushing with extra promotion? If you said Northpole, you are correct, though I have no idea why that one is getting the bump. I’m definitely most interested in The Nine Lives of Christmas, but I’ll give all these films their dues as their air dates approach and their trailers and promotional images begin to appear.